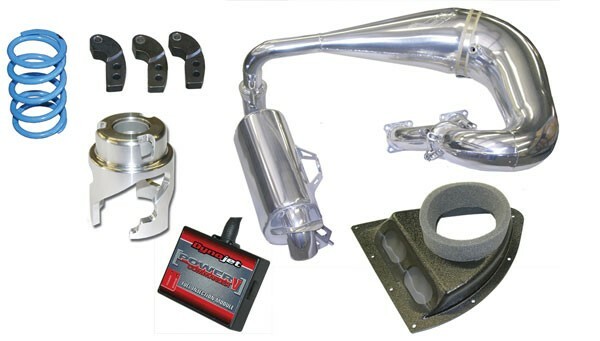 The Stage 2 kit combines our Single Pipe kit, High Flow™ Intake Kit, Power Commander V with custom tuned map, and the appropriate SLP PowerShift™ Clutch Kit for your elevation. This gives a 8.5 horsepower increase and a weight savings of an amazing 20.8 pounds! On the snow, the first thing you will notice is how much lighter and more nimble the sled feels. Then point it up a hill or across a lake and whoa.....you're going to realize just how far your sled has transformed from stock. Better throttle response, more power, lighter weight with more consistency...yeah, that's what we like in our sleds and this kit delivers it well.